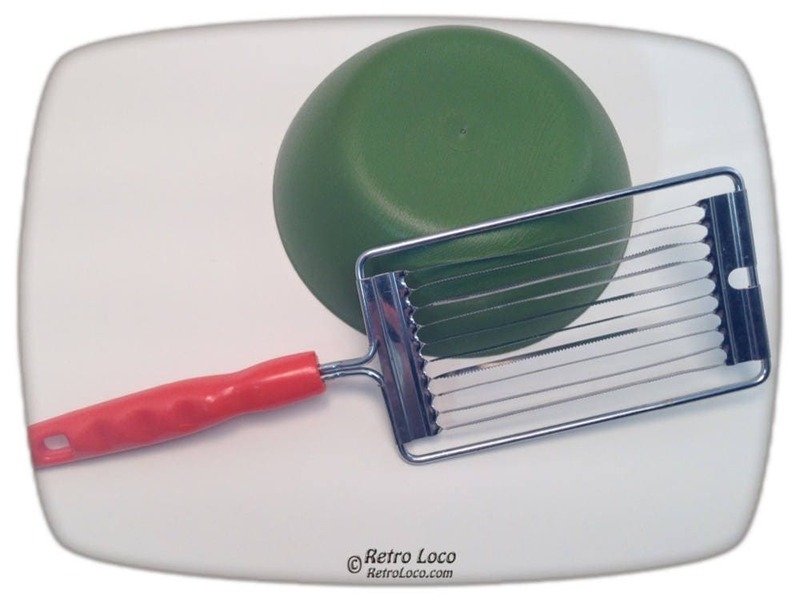 70's tomato slicer orange, plastic handle, metal blades. Hang it on a wall in your groovy, 70's style vintage kitchen! Cute and shiny utensil for a vintage seventies kitchen. It was intended to slice soft fruit and vegetables/veges such as tomatoes, bananas, mushrooms and maybe eggs. The blades will definitely bend if slicing harder produce such as apples. Has a convenient hole for hanging on a cup hook or small nail. ❉ Condition: Some of the metal blades are bent. Probably better suited for decorating than functionality. It looks nice, but it is not in the best condition for slicing produce.